Twmpath: why we're kicking up the sawdust in Wales and the world! 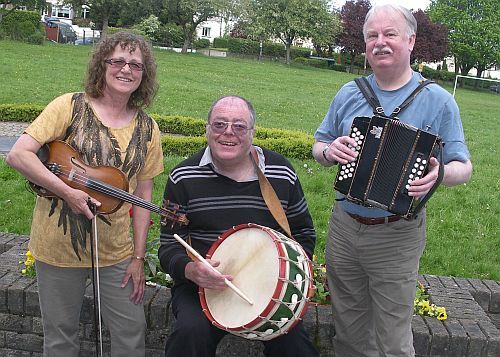 Meet Mike Greenwood (melodeon), Olly Price (fiddle) and Mick Tems (tabwrdd). The three are experienced musicians, playing Welsh dance tunes together at festivals in Fylde and Whitby (England), Tredegar House in Newport (South-East Wales), Ireland, Belgium, Germany, Denmark, Finland and Latvia. Mike lives in Penarth, Cardiff, and Mick and Olly both live half a mile from each other in the Beddau area, near Llantrisant, Glamorgan. Mick and Olly are musicians for the Welsh dance team Gwerinwyr Gwent, who are based in the village of Bassaleg, near Newport, but Mike plays for assorted Welsh, clog and morris teams and used to accompany Gwerinwyr Gwent (and still does!) Mick, Olly and Mike play for Dawnswyr Ar Daith, the all-Wales dance team. This video shows Dr Price's Fire Band and caller Chris Oates whipping up a storm at the Tredegar House Festival fundraising night in Newport. Dr William Price was born in Machen, Monmouthshire on March 4, 1800. He lived in Caerffili, London and Pontypridd, before settling in Llantrisant. He was a physician, an archdruid and a brilliant, visionary man; stories about him are legion, but his claim to fame was when he pioneered cremation by performing the deed on his dead baby son, Iesu Grist Price, whom he had fathered at the age of 88. What else to name a trio of musicians but... DR PRICE'S FIRE BAND. Fiery, proud, beautiful Welsh tunes are our first love, but our travels far and wide have led us to believe that all traditional dance music cuts the mustard pretty finely - Quebecois reels, Scots jigs, and Yorkshire rants... you name it and we'll enjoy playing it. If you want to book DR PRICE'S FIRE BAND for a barn dance, a twmpath, a festival, a wedding, birthday party or a knees-up, ring Olly on 01443 201634 or e-mail Dr Price. He won't let you down!